← Fort Jacques Field Trip! I am sitting here, completely in awe. As most of you know, Matt and I both get to work with a group of men and women called “Village Champions.” Matt works with them pretty much all day every day and loves it. I get the honor of teaching English to them. And can I just say, WE . LOVE . THEM. 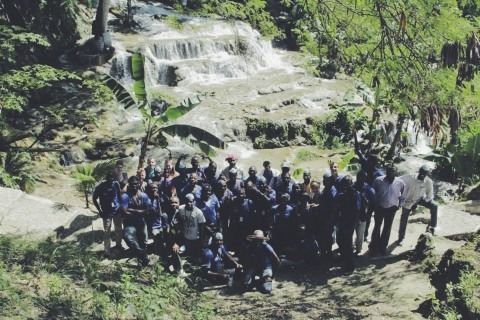 When people ask us what our favorite thing about living in Haiti has been so far, we always respond with the relationships that we’ve built with our staff family and with our Haitian family. This is by far one of the most unique communities I’ve ever been a part of because we truly are family. All of us. And it is simply wonderful. This afternoon I had the advanced English class, which is easily growing to become one of my favorite times of the week. Especially after today. We have always known that there is something beyond special about this group of men and women, which is why we love them so. 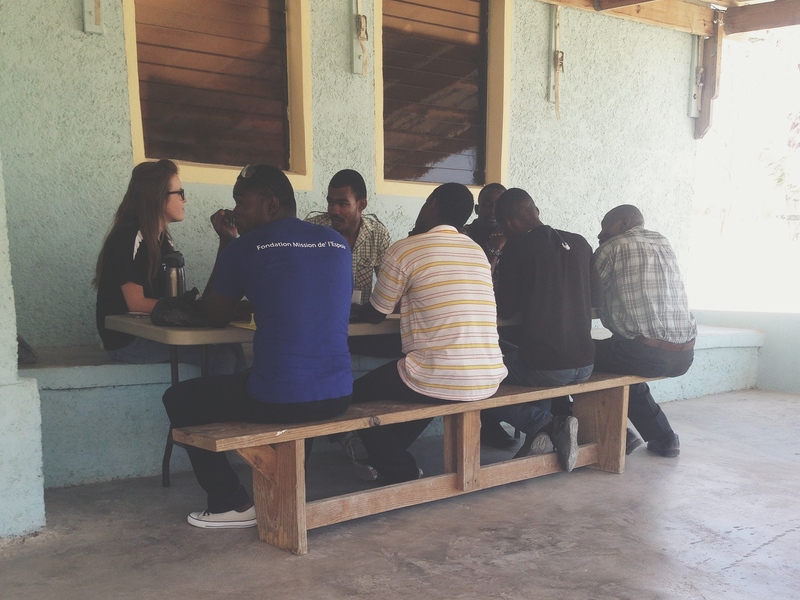 Ya’ll, God is using them in their villages to truly change this nation. In class today, I got to sit on the front row and listen as I could see the redemption of this nation happening before my eyes. Last week, I had the advanced students share their testimonies with me. Hearing how they came to know Jesus was such a sweet moment for me, but also for them to hear how the Lord had individually and uniquely pursued each and every one of them. Their stories left me truly seeing how powerful and Sovereign our God is. Today knocked me down on my face. No joke. I think I had to hold tears back the entire class. Today’s topic? The Gospel. For over an hour, I sat and listened to each of these beautiful people share how they would share the gospel to people in their village, and to team members who come down and don’t know the Lord. All in English. I was amazed. I was amazed at how they almost had to argue over who wanted to go first. They were armed and ready with the truth. They weren’t shy. They weren’t nervous. They were ready. How often am I truly ready to share the gospel without hesitation? Especially in front of a group of my friends who know the Gospel. They’re going to pick apart what I say. What if I forget to say something? What if I mess it up? Pathetic. Absolutely pathetic. Like I said, today knocked me down on my face. I was amazed at how they not only spit out how they are actively sharing the Gospel with people in their village, but every single one of them was spitting out Bible verses and truth as fast as I could blink. There was not a quiet moment in our discussion of the Gospel. If one of them said something the other would come back, supporting what was said before with scripture. Oh, do they know their bible!! Again, without hesitation. They were armed. Armed with the truth so that they were able to use it to encourage, comfort, disciple, and share Christ with all those they come in contact with. Again, knocked to my knees. I was amazed by their confidence. They were armed, they were ready, and oh they were confident. I asked them some tough questions. They’re faced with some really tough situations on a daily basis, so I challenged them and played devil’s advocate. “What if someone tells you that they’re already going to heaven because they’re a good person? Then what?” They answered with mercy, wisdom, and confidence. “What if someone tells you that they will only except Jesus if the Lord blesses them with more clothes, food, and a nicer house? What do you say?” They answered with truth, grace, and confidence. By the end of class, I was speechless. My eyes were raw and my heart was filled. They get it. They really get it. I am so thankful the Lord has blessed us with the opportunity to live here and to do life with these men and women daily. We wouldn’t trade it for the world. Today was so sweet and such a beautiful, precious reminder of why we are here. God is being made known to every man, woman, and child. The Kingdom is advancing and redemption is here. Praise King Jesus! I love Him and what he is doing through y’all in Haiti! !